First the “big time” Hollywood producer had his wings clipped. From hobnobbing with the likes of Leonardo de Caprio and the Hollywood set, Riza Aziz is now hiding behind the skirt of big fat mama. Nowadays Riza uses diapers ….not on his head….but under his trousers because he is scared shitless that the US DOJ will swoop down upon him and take him away the same way they did with Osama Ben Ladin. So most of his days are spent not hiding behind the skirt of Big Mama but hiding UNDER the skirt of Big Mama. There is room under Big Mama’s skirt for a Bean Bag and cable TV to keep Riza from getting bored. Riza dares not show up in his multi million pad in New York, London or anywhere else where he has spend OUR money to buy properties for himself and for his mama aka Flying Hippo. The only reason he is not in remand or under arrest is because Najib is still prime minister of Malaysia. When Najib goes, Riza goes in….either Sugai Buloh or some holding cell under the care of the Department of Justice of the United States. Long story short…Riza Aziz sudah mampus. Now it is Jho Low’s turn. The jet setting billionaire lifestyle he has been living these last few years is now entering what the Chinese say is the “die standing” stage. And like that pondon Idiot who kepit his balls, this roly poly Joh Low is just a mass of protoplasm and he too cannot run. He can waddle like a duck, and, like the Flying Hippo, is most comfortable in water. On dry ground, his movements are somewhat ungraceful, to say the least. Take Equanimity away from him and what do you have? A fat slob whose days of tripping the light fantastic is over. And once they slip the cuffs on him….not Paris Hilton, not Miranda Kerr nor any of those money grabbing money loving ladies will have any time for him anymore. I am still waiting for news as to whether they have him in custody abroad the ship…or they have him in remand somewhere in one of the cells in Indonesia or in parts unknown. Or maybe the US DOJ is already flying him back to the US for, after all, he is a person of interest to them in their attempts to get to the bottom what happened in 1MDB. As for PDRM they have had problems trying to locate Jho Low. You cannot blame PDRM because even if Jho Low is fat, there are a few billion people on this earth and the fatso can be anywhere. Maybe Joh Low evaded capture and is now swimming to Batam….as for Mr and Mrs Idiot they must be shitting bricks thinking of what is now happening in Bali…..
Indonesia on Wednesday seized a luxury yacht on the island of Bali sought by the US Department of Justice as part of a multi-billion dollar corruption investigation linked to Malaysian state fund 1MDB, police said. 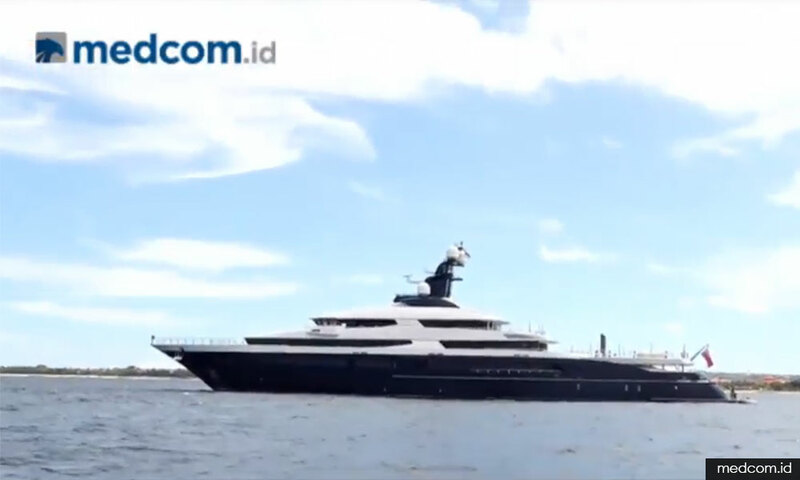 “We have been inspecting the crew since yesterday and now we are taking action, since we have received approval from the court to seize the boat,” Agung Setya, director of economic and special crimes at Indonesia’s criminal investigation bureau, told Metro TV. Reuters reported that television footage in Indonesia showed Indonesian officials talking to the crew on board the moored yacht. It is not known whether Jho Low, the owner of the superyacht, was on board. According to Indonesian media, the seizure was a joint action between the Indonesian authorities and the US Federal Bureau of Investigation (FBI).